← Berry Go Round #23 is out!! A single field trip up toward the Central Highlands offers plenty for a plant lover to see and do. One thing that must be done however, is to pay homage to the cider gums (Eucalyptus gunnii) of the highland areas. 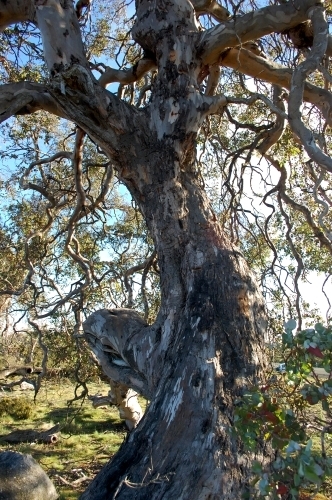 This cider gum is a tree of immense significance to Tasmania’s natural history. It is aptly named the cider gum for it’s sap, which has been reported to be used by the aborigines to make a much relished fermented drink (see article). I was way too late to experience the spring sap that allegedly drips from the tree inviting all to partake of it’s sweetness. What would I give to try that out! It would be one of the most direct means of communion with the cider gum. On this occasion however, my objective was merely to make an acquaintance with the Cider Gum in it’s natural abode. I drove along the Highland Lakes road north of Miena hoping to catch sight of some cider gums. There are two known subspecies, both of which are endemic to Tasmania. The more common one, E. gunnii subsp. gunnii (simply referred to as the cider gum) is well distributed throughout the highland regions of the southeast, central, and western Tasmania. The other subspecies, E. gunnii subsp. divaricata is known as the Miena Cider Gum, and has a much more restricted distribution to a small area around Miena around the Central Highland lakes. 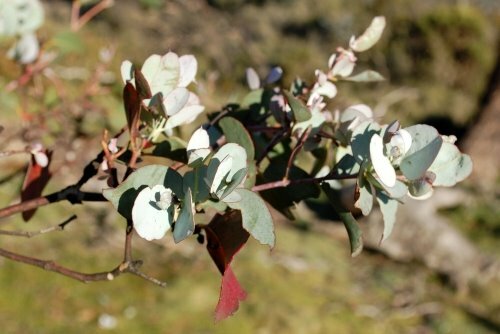 It’s status as a subspecies of the commoner cider gum was only recently elucidated in a publication by Prof. Brad Potts, Dr Wendy Potts and Dr Gintaras Kantvilas in 2001. Previously, the Miena Cider Gum was known as Eucalyptus divaricata. I practically screeched to a halt when I sighted just by the side of the road, two large and stately trees which I suspected might be the Miena Cider Gum. I got out and scanned the surrounds. There were quite a number of dead trees in the vicinity but these two trees were different. They exuded a vibe of vitality. I studied them intently, looking out for characters that might give me an opportunity for identification. A low hanging branch gave me access to photograph a cluster of their leaves and their capsules. The adult leaves also had a slightly pale whitish (glaucous) appearance and there was the persistence of very glaucous, rounded and oppositely arranged juvenile leaves. 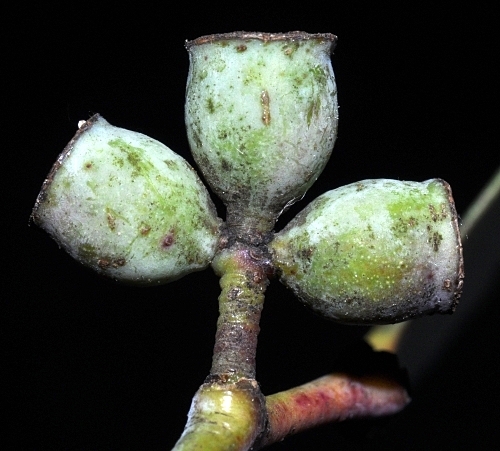 Prof Pott’s paper had mentioned that the capsules of the Miena Cider Gum also tend to be more glaucous. The capsules are supposedly a slightly more sub-urned shaped compared to the more consistently bell shaped capsules of the commoner subspecies. The combination of characters of the Miena Cider Gum seemed to match the specimen I was looking and I am happy to conclude that that was what my specimen was. More important than the dry an technical act of nailing an subspecific identity to the tree however, was the feeling of communion. Few experiences compare to an acquaintance with trees of such haunting magnificence and presence. There is no words for it, only feelings that linger. Silence would probably make the best conveyance of this. This entry was posted in Botanical Heritage, Bush Tucker, Ethnobotany, Eucalypts, Key Characters, Plant Appreciation, Plant Morphology, Tasmanian Endemics, Trees and tagged Brad Potts, cider gum, Eucalyptus, Eucalyptus divaricata, Eucalyptus gunnii, Eucalyptus gunnii subsp. 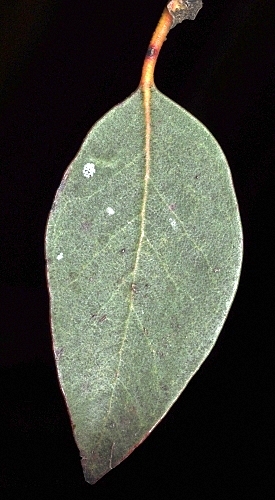 divaricata, Eucalyptus gunnii subsp. gunnii, Gintaras Kantvilas, Miena Cider Gum, Myrtaceae, Threatened Plants, Wendy Potts. Bookmark the permalink. You described it well David, wonderful tree. I’ve got some favourites that give me the same feeling. Thanks Duncan. What would be your favourites? Thats awesome. 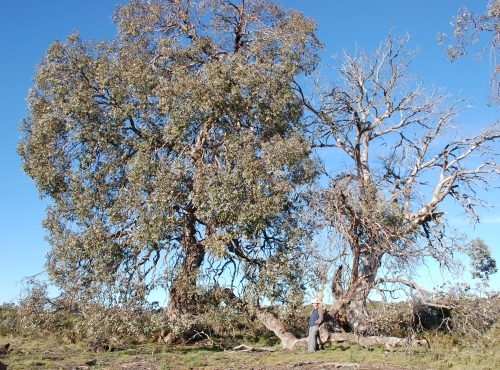 It’s hard to say how old eucalypts can get, especially some of those that make lignotubers. They might be over a thousand. Even those that die in a fire like E. regnans can get up to 500 yrs old. Old trees are really like people. They become more charismatic and awe-inspiring as they age!